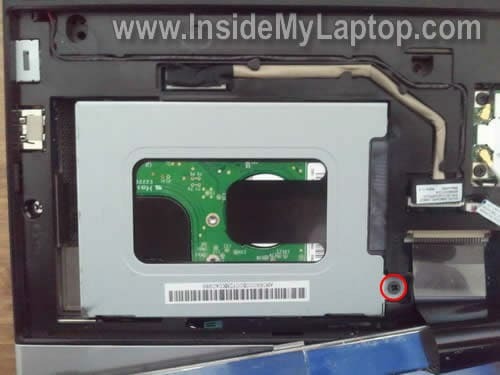 In the following guide I explain how to remove the hard drive from a Dell Inspiron Mini 10 (1010) netbook. There is no easy way to access it from the bottom. The drive is mounted inside the case under the keyboard. Turn off the laptop, unplug the AC adapter and remove the battery. Remove three screws from the bottom. These screws secure the keyboard. 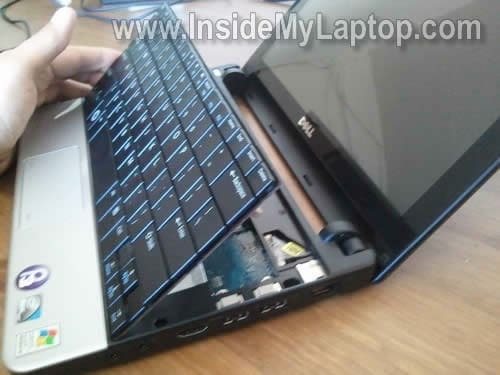 Insert a thin object between the top side of the keyboard and laptop case. Lift up the keyboard and continue removing it with your fingers. Lift up the keyboard as it shown on the picture below and flip upside down on the palm rest. Now you can access the hard drive assembly. The wireless card also located here. If you would like to replace the keyboard, you’ll have to unlock the connector and release the cable. 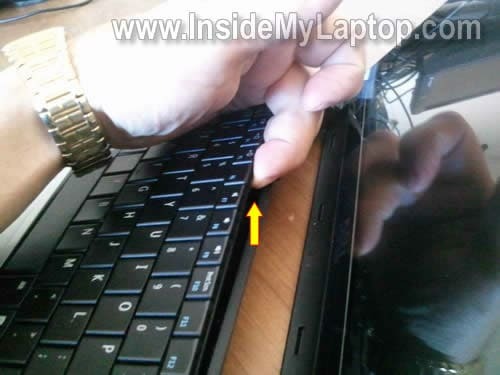 In order to unlock the connector, very carefully move the brown lock about 2 millimeters towards the touch pad. The lock must stay attached to the connector base. When the connector unlocked, you can pull the cable and remove the keyboard. Remove one screw securing the hard drive assembly. 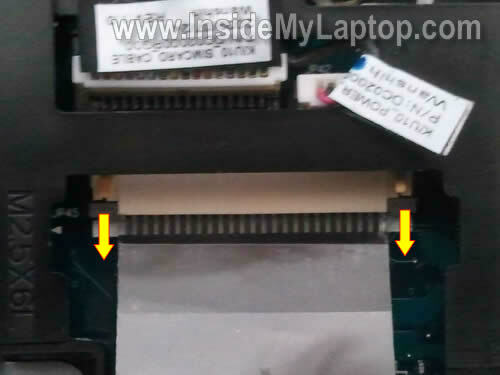 Slide the assembly to the left and disconnect it from the motherboard. Now remove four screws securing the caddy, remove it and transfer to the new drive. In my case I had a regular 160GB 2.5″ SATA HDD installed. This drive can be upgraded with any larger 2.5″ SATA HDD. Thank You! 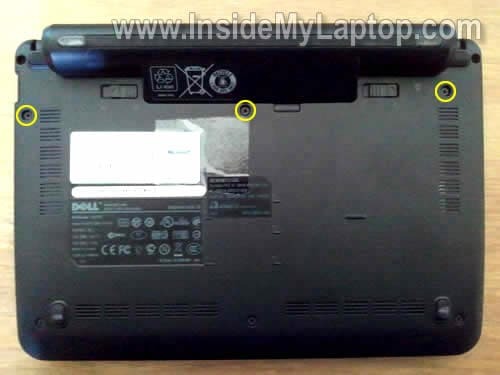 Dell should be paying you for not only a great step by step guide but for being able to easily find it online! Dell should be paying you for not only a great step by step guide but for being able to easily find it online! Alternatively, you can use my guide and replace it yourself and pay just for the hard drive. This is a wonderful step by step guide to installing the hard drive. Thank you very much it is installed. Only took about 20 minutes. Thank you so much I was totally lost and the Dell website was way confusing. You are the greatest. From one tech to another..my thanks, & gratitude, & donation on the way….worth every penny… saved me a ton of time & headaches….now if I can just figgure out how to split the bottom case on the d620 ??? 🙂 Bet you have a “how to” on that as well….thanks again Tekkie !! now if I can just figgure out how to split the bottom case on the d620 ??? If it’s not enough, check out this official service manual. It has full disassembly instructions. From one tech to another..my thanks, & gratitude, & donation on the way….worth every penny… saved me a ton of time & headaches…. I cannot reinstall WinXp – Mini 10 wants me to “insert disk in Drive A” – which does not exist. What can I do to trick the net book in letting me install Win Xp? Frustrating because it loads on the external CD/DVD rom but wont take further action until this DRIVE A is used. PLease help!!! Thanks. I cannot reinstall WinXp – Mini 10 wants me to “insert disk in Drive A” – which does not exist. What can I do to trick the net book in letting me install Win Xp? Frustrating because it loads on the external CD/DVD rom but wont take further action until this DRIVE A is used. If I understand correctly, you are trying to boot from an external CD/DVD drive but it’s asking for Drive A? Can you enter the BIOS setup menu and load default settings. Try again after that. Can you see the hard drive in the BIOS? Thanks so much for this helpful guide! Saved me lots of $$$ for the holidays. I’ve had to replace the hard drive in a dell mini 10 netbook with no cd rom drive available, how can I get this loaded with an OS? You need an external USB DVD drive. I have something hard under the ‘i’ key. How do I remove it to clean under it? Hey dude, thanks for posting the link to replacing keyboard keys, I couldn’t find a way anywhere else. My screen got wet and faded away.. Ever since that its still the same everytime i turn it on it slowly fades away snd stays blackish/grayish.. Please how do i fix this???? Can you get image on the external monitor? What a great guide, thanks. I believe my hard drive is, for lack of a better word, f**ed. I quite experienced with the operation of computers and such, but am lacking in experience with hard drives. How would i know for sure that the hard drive is “f**ed”? How would i know for sure that the hard drive is “f**ed”? Does your laptop still boot? If it boots, you can test hard drive with HDTune utility. Run error scan. 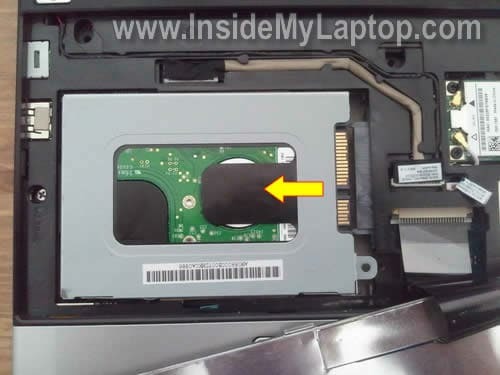 If the laptop doesn’t boot, you can remove the hard drive and test it on a working PC. I usually test hard drive with SeaTools utility (frim Seagate. Thank you so much!!! I installed the new hard drive in less than 10 minutes. A first time replacement!!! the soldering for where the power switch is connected to the mother board broke apart. I re-soldered it, but the two pins ended up being soldered together in one large solder as opposed to the two small ones previously. My computer won’t turn on. Do the pins need to be soldered separately? Where can I find a Dell Inspiron Mini 10 Hard Drive? Can someone give me a link? Hello. 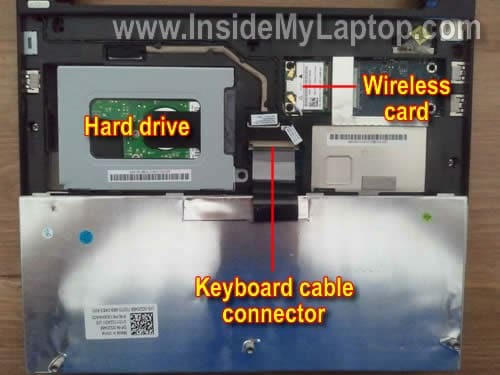 Great guide for removing the keyboard and replacing the hard drive. I have a Dell mini with a broken audio output jack. Do you have instructions on how to fix it? I have a Dell mini with a broken audio output jack. Do you have instructions on how to fix it? I don’t have this guide. Most likely the audio jack soldered directly to the motherboard. You’ll have to remove the motherboard and find someone who can desolder the broken jack and solder a new one. Here’s service manual for this model. Should help. Please could you tell me how to install windows on a dell mini. Do you have Windows installation dics? Do you have an external USB DVD drive? My question was whether the Dell Mini Laptop or has no hard drive. I wanted to see if by chance something is badly connected and up to test out the disc because it is giving error message: Operating System not found. my dell mini battery shorted and damaged two adapters while trying to charge as adapter light continuously blink and finally off permanently during battery charging but lapy fine works directly on adapter without battery, pls help any solution for battery shortage problem? Have you tried replacing the battery? wow you are awesome. thank you!! 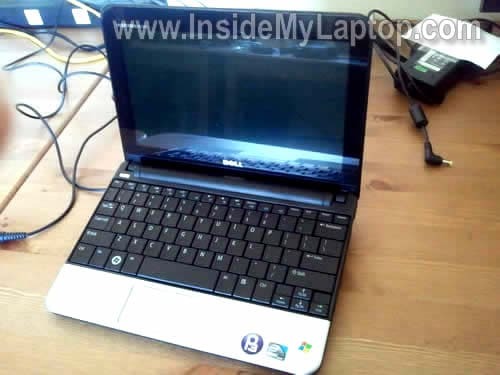 You can install windows on these netbooks in one of two ways. 2. Bootable USB pen drive. with the first option, all you do is take your normal installation disk and put this into the external drive and go into your BIOS settings and boot from the external drive first. The second option is a little more time consuming to setup. It involves copying your installation disk as a bootable ISO format and then using PowerISO, you can convert the disk files onto your pen drive, the software will also allow you to make the USB device bootable. In either case, going onto google will be the best way to get the relevant knowledge and also the software tha you will need. I hope this information helps you and do let e know on here how you get on. I have got a dell mini and my HDD password is lock also I press f2on startup also ask for password how can I unlock it . If you forgot the HDD password you will not be able to remove it. You’ll need a new HDD. I’m not sure if there is an easy way to clear the BIOS password. What is your laptop model?